What Are The Best Online Bachelor's in Internet Marketing Programs? What Can I Expect From an Online Bachelor's in Internet Marketing Program? As the world becomes increasingly interconnected through internet technologies, companies and organizations have recognized the necessity of creating and analyzing online marketing, advertising, and public relations campaigns in order to compete in the global marketplace. An online bachelor's in internet marketing prepares you for work in this exciting and lucrative field, which is expected to grow by more than 10% over the next ten years as projected by the Bureau of Labor Statistics. Graduates are prepared for careers as advertising agents, copywriters, promotions specialists, and more. Online bachelor's in internet marketing programs offer an interdisciplinary curriculum that combines traditional business and marketing fundamentals with coursework in technological applications. You can expect core requirements in topics like marketing strategy, consumer behavior, professional selling, search engine optimization, and e-marketing. Capstone requirements are rare, but may be required based on the program you choose. Students can expect an emphasis on group projects and internship experiences. 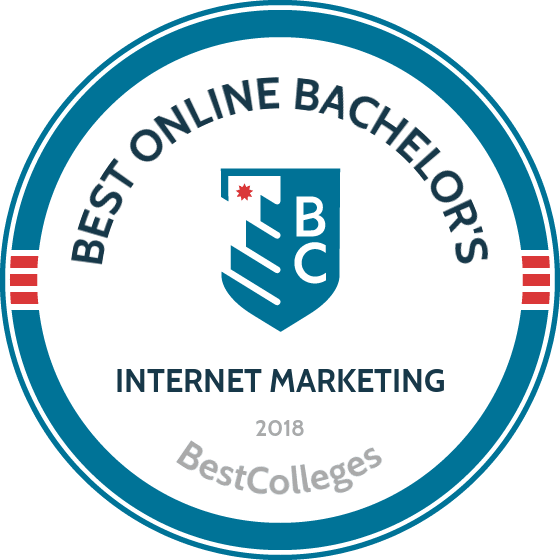 Online bachelor's in internet marketing degrees are becoming more popular, but you will find a number of differences between program requirements. Some programs offer specializations in internet marketing, while in others it will be part of the core curriculum. This gives students flexibility in choosing their degree, enabling them to pursue topics that best suit their interests, like mobile communications, social media marketing, and global business. It's important to know what your careers goals are before applying. Located in Boone, North Carolina, Appalachian offers a variety of online programs available to students across the country. The online bachelor’s in communication with an advertising major covers the latest innovations in branding, marketing, and creating an online presence. The curriculum requires 45 credit hours, and students complete the online degree in advertising in as few as three years. Coursework covers topics including social media marketing, personal selling, international advertising, and media production. Students choose from two emphases — creative or business — and are required to complete a minor. Suggested minors include graphic design, studio art, marketing, and business. Appalachian State University is accredited by the Southern Association of Colleges and Schools Commission on Colleges. California Baptist University’s bachelor’s degree in graphic design and digital media utilizes the latest design software, such as InDesign, Dreamweaver, and Illustrator. The curriculum emphasizes personal expression and project building. Students produce portfolios, which they present to prospective employers after graduation. Students are prepared to work with online platforms to craft web pages, evaluate public messages, and design brands and concepts. Through a series of web design courses, students hone skills in HTML and CSS. Students learn about the history of graphic design, typography, drawing, and composition fundamentals. All CBU students complete two religion courses: an overview of the Bible and foundations of Christian thought. California Baptist University is accredited by the Western Association of Schools and Colleges. Located in Eugene, OSU offers two options for students pursuing their digital marketing degree online: a bachelor's of art in business administration and a bachelor's of science in business administration. Both programs offer a specialization in digital marketing that provides students with practical skills related to global business markets. Courses explore search engine algorithms, marketing analytics, and consumer behavior. OSU's online digital marketing degree requires 180 credits, including 36 general education credits, 48 pre-business core credits, 36 to 64 business credits, and 32 to 60 elective credits. The programs follow a quarter system, and most students graduate in four years. OSU accepts transfer credits on a case-by-case basis. Oregon State University is regionally accredited by the Northwestern Commission on Colleges and Universities. Based in Tempe, ASU offers a bachelor’s degree in mass communication and media studies that educates students in the mass communication behind politics, business, and the nonprofit sector. The program explores social media marketing, popular culture, and gender and racial studies. ASU's program requires 120 hours, including at least 45 hours of upper-level coursework. Most students complete the program in four years, but students who choose the fast-track option can graduate in three years. Major courses cover topics including media and society, social behavioral sciences, mass communication, and historical awareness. Graduates often become public relations specialists, producers, analysts, and teachers. ASU accepts transfer credits from accredited institutions. Arizona State University receives accreditation from the Higher Learning Commission. National, located in La Jolla, California, offers a partially-online bachelor of arts in integrated marketing communications. This program applies marketing principles such as advertising, sales promotion, and public relations to modern technology, making the major relevant to workforce demands. The foundation of this degree is composed of business and communication fundamentals. The internet marketing degree online program incorporates education on print, broadcast, social, personal, and mobile media throughout the program’s coursework. Students must complete at least 45 of the 180 credit hours on campus. A full-time student will typically take one academic year to complete their required on-campus classes. Courses include intercultural communications, communications technologies, persuasion, and communication strategies. The program ends with a marketing project where students show their learned skills through a research assignment or internship. There are two prerequisite courses: effective college english and marketing fundamentals. NYU's bachelor’s in digital communications and media takes a contemporary view of national and international marketing. The program incorporates coursework in media design, filmmaking, digital management, editing, and the fundamentals of computing. Graduates are prepared for careers in television and game design, media law, and media management. Students earning the online marketing degree complete 16 elective credits in one of three specializations: systems management, leadership and management studies, or media studies. Students complete a portfolio-building seminar, during which they polish a personal portfolio, website, or Vimeo site. Students also undertake a final project seminar or internship. New York University is regionally accredited by the Middle States Commission on Higher Education. Penn State's online bachelor's of design in digital multimedia design trains students in technological and product-based marketing and design. The project-based curriculum teaches students to communicate on a large scale and improves problem-solving and analytical skills. Students earning the internet marketing degree online complete coursework across disciplines, including classes from the College of Arts and Architecture, the College of Communications, and the College of Information Sciences and Technology. The curriculum requires 120 credits, including a series of multimedia design studios. Students can specialize in digital design, interactive media development, video production, or media for civic engagement. This program culminates in a capstone project. Pennsylvania State University is regionally accredited by the Middle States Commission on Higher Education. Based in Lakeland, Florida, SEU offers a bachelor's of science degree in digital media and design. Students gain communication skills through coursework in web design, digital media, and marketing analytics. The curriculum includes studios during which students hone design techniques including photography, magazine and webpage design, and advanced illustration. Students also complete coursework in writing for mass media, mass communication law, and digital marketing and analytics. Graduates are prepared for careers in international and intercultural communications. The 120-credit program comprises 56 general education credits, 37 major credits, and 27 elective credits. Students complete the program in as few as two years. SEU is a Christian institution and requires 18 credits of theology courses. Southeastern University is regionally accredited by the Southern Association of Colleges and Schools Commission on Colleges. Granite State, located in Concord, New Hampshire, offers a bachelor of science in digital media. The online internet marketing degree curriculum combines traditional marketing fundamentals with modern technology in the field. Eighty-four percent of enrolled students transferred to the school. Granite State allows up to 90 transfer credits. U.S. News and World Report named the college’s bachelor’s and master’s programs among the best online. Courses include foundations of digital media production, trends in digital and social media, global marketing, and consumer behavior. Students become proficient in messaging and information management, emerging environments, and vital technology. Graduates are prepared for careers as communications coordinators, social media analysts, content managers, and more. Career counseling is available to all students. Admissions applications are accepted year-round. Granite State offers credit for prior learning experiences. Online courses are taught through Moodle. Granite State is an accredited Military Friendly school. This section is designed to give you an overview of course requirements often found in this type of degree. Use it as a starting point for further research and preparation as you begin the journey of finding the school that best suits you. Information here is particularly useful in discerning the type of prerequisites that may exist and what transfer credits may be applicable. Below are courses that are common to online bachelor's in internet marketing programs. Details may vary and change and it is always best to consult individual academic advisors for a school's most up-to-date requirements. Consumer Behavior: This course explores the sociological and psychological aspects of human behavior that influences the behavior of consumers in the act of searching, purchasing, using, reviewing, and selling/disposing of products. As a fundamental topic, courses of this nature provide students with the knowledge they need to create and implement effective marketing campaigns. Interactive & Mobile Campaign: A more advanced course that focuses on integrating new techniques and tools to design, create, and actualize advertising and communication campaigns. Students will learn how to use delivery methods like social media, mobile devices, and location-based and algorithmic messaging. Market Research & Analytics: This course provides students with the knowledge and skills they need to develop and implement qualitative, quantitative, and other research initiatives, using tools like surveys, controlled experiments, and focused groups. Consumer research and analysis is crucial to anyone in a marketing position because it enables them to use data and observable information to enhance organizational gain and brand equity. Professional Selling: The ability to create and communicate value of a product, brand, or organization is important to many professions. Courses like this provides students with a look at the process and methodology of the sales process, including business-to-business and business-to consumer relationships. HOW LONG DOES IT TAKE TO GET AN ONLINE BACHELOR'S DEGREE IN INTERNET MARKETING? The best online bachelor's in internet marketing programs usually take around four years to complete. Students need to fulfill core major, elective, and general education requirements. Many online options offer the degree as a completion track, enabling students to take half or more of their courses at another school, usually a community college where tuition is less expensive. Then students can transfer that work into their bachelor's. The length of the program may also be dictated by whether it is a fully online degree pathway or a hybrid program that requires students to take some courses or fulfill certain requirements on campus. Another important program characteristic you should look into is whether the program is taught through an individual or cohort format. The former model is asynchronous and individually paced; it's popular among online programs. The cohort format has a group of students progress through the program in a synchronous matter. This format usually takes longer to complete. However, marketers and other business professionals spend much of their time working in teams, so the best online bachelor's in internet marketing program for you, based on personal preference and professional goals, may contain a combination of both learning structures. Colleges and universities in the United States must acquire and maintain accreditation from one or more organizations in order to prove that the quality of education they offer and the degrees they grant are up to par with national standards. As the term suggests, national accreditation, granted by the U.S. Department of Education and/or the Council for Higher Education Accreditation, is the standard and the most ubiquitous form of official academic recognition. Regional accreditation is granted by one of six regional organizations. Regional accreditation is more prestigious than national and preferred by most employers. The best online bachelor's in internet marketing programs will have national and regional accreditation, and perhaps even recognition from prominent professional organizations in the field, like the American Marketing Association. National accreditation is granted by the U.S. Department of Education (DOE) and the Council for Higher Education Accreditation (CHEA). The former is a government body, while the latter is private and non-governmental. A school must be recognized by the DOE to be able to offer financial aid. The CHEA stamp of approval is tied to academic integrity and professional development. For more information, visit the DOE's and CHEA's websites. Internet marketing and its related functions are indispensable to the success of a business or organization. Interactive business strategies, mobile campaigns, search engine optimization, and other skills that you will learn in the best online bachelor's in internet marketing programs will only continue to grow in importance. The data below comes from the Bureau of Labor Statistics and projects a 9% growth in the United States of managerial positions in the field, which is above the average projected growth rate. Annual salaries for positions in the internet marketing field vary and depend on an applicant's experience and the specific industry in which they work. Listed below are the five highest-paying states for marketing managers according the Bureau of Labor Statistics. Some entries, like New York and California, reflect the prominence of the advertising, marketing, and applied communications industries in those states, while others represent an overall growth in a state's economic prosperity. The ability to communicate persuasively (particularly from a sales standpoint), work well in teams, and create effective publication relations and advertising campaigns are always in high demand. A degree in internet marketing combines these skills with the knowledge of popular and emerging technologies, enabling you to work in a variety of fields and for a number of businesses and organizations. Below are some examples of careers this degree prepares you for. Fundraisers help raise money and other donations for a group or organization. Usually working in the nonprofit sector, they may also create promotional materials and information sessions to help raise awareness and interest. These managers put together campaigns for clients and work in advertising agencies. They also facilitate the sales of advertising in media. In a marketing context, graphic designers create and develop various tools and products designed to advertise a company's product or service electronically. Using visual concepts, they communicate ideas and captivate consumers with websites, mobile ads, and more. These analysts study market condition and consumer trends to examine how they would affect the success of a product or service in the marketplace. They collect data, do research, and create reports that influence the way business is run. Responsibilities include organizing, directing, and evaluating sales teams in the creation of projects related to company transactions and growth. They also analyze data and develop programs to increase the efficiency of a company's operations. Professional development and networking is important to the success of any career. By pursuing membership in the organizations that best suit your interests and goals, you can build and leverage your skills towards job advancement and overall marketability. Founded in 1953, the AMA is the largest professional organization in the field of marketing best practices and related business research. The organization offers a plethora of in-person and online seminars that are dedicated to improving specific skills. They also host an annual national conference. The IMA is one of the fastest growing professional groups in the various related fields, including sales, business ownership, programming, and general creative development. It fosters corporate partnerships in order to provide its members with unique professional resources, including information databases and internship opportunities. The IABC was established in 1970 with the goal of connecting businesses and organizations across the world. The organization serves professionals in the field through educational offerings, a resource library, and various conference opportunities. There are many ways to pay for your bachelor's degree. While loans may look like the go-to method, they can result in financial instability down the road. Look into financial aid opportunities like grants and scholarships, which are available through the government and colleges and universities. The FAFSA helps in determining which resources are available to you and how to obtain them, and because internet marketing is a growing field, you should research corporate and other private awards as well.